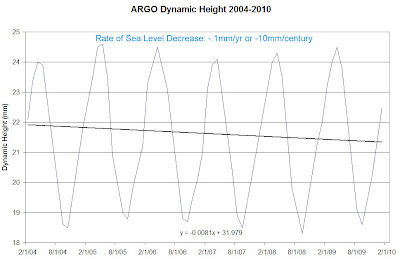 A trend found in ARGO DH data is likely to be reflected in sea levels. 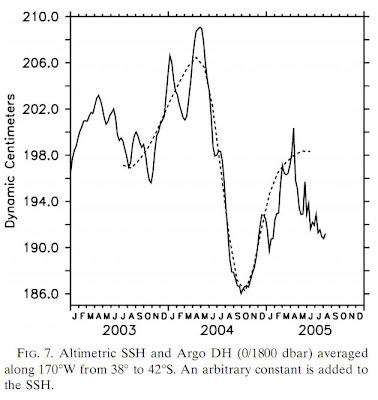 Also see the Rebert paper on the relationship of dynamic height and sea levels. 2. Comments regarding quality control of the data used in Pacific Marine Atlas program are addressed in this paper, which notes that the ARGO data undergoes extensive realtime and delayed quality checks prior to release for use in the Pacific Marine Atlas program. UPDATE "Global Sea Level Decrease 2004-2010 Part 2"
What the greens and the ipcc have been doing for decades. Sea level budget over 2003-2008: A reevaluation from GRACE space gravimetry, satellite altimetry and Argo. A. Cazenavea et al. Which argo buoys did u use? All of them? Or just the tropical ones, where correlation between dynamic height and sea level is good, if you listen to J.P. Rebert et al..
And what about the quality control of Argo, which data sets did you use? All of them? If you don't know which direction you are holding the gun, better don't pull the trigger. Since you probably are a concerned person and thought you really were onto something, I propose you post an update and admit that you got a few things mixed up. There are at least 4 papers from the last 2 years out there concerning sea levels and Argo. Why don't you pick out a few, take a look at their methodology, learn from it and then try again? What about those poor people in The Maldives? How are they going to milk us all if this gets out? tropical Pacific. Therefore, the results must be considered preliminary, and the analysis will have to be repeated after a larger data set has been accumulated like the one for Honolulu." The ARGO buoys have only been at 100% since 2007. Why does SS want to regress to old and "preliminary" information when we have much better monitoring (and understanding) today. Could it be that SS is in denial? As for the 4 papers over the last 2 years, could it be they are as thoroughly peer reviewed as the 2007 IPCC report? I guess that will remain unknown since SS did not disclose source material. Gosh another alarmist without any facts. Science Shmience: now now, no need to get testy. I have not "pulled the trigger" on anything. I am simply using a program supplied by ARGO which automatically downloads the "unadjusted" ARGO data to produce the second graph above, digitizing the graph data (since the Pacific Marine Atlas will only output graphs of data, not the datapoints), and adding the trendline. The post simply tells you what I did and the result, and you can easily replicate this for yourself. Draw whatever conclusions and caveats you please. To answer your questions, I did use All of the floats All of the time from All of the data (as shown in the bottom right of the second graph). Now then, how do you propose that I "adjust" the data? Should I throw out the floats that show a downtrend, or just adjust them upward since they couldn't possibly be correct? Should I throw out all the floats outside the tropics? Let me know and I'll post your suggested alterations to the "raw" data. The 25 year old paper you cite based on older technology and analysis states "Sea level and dynamic height agree well in the tropics...near unity...but outside the tropics it is less than 1..." Well, less than one doesn't mean zero and they fail to specify how to further "adjust" those. The paper also fails to mention that tropical measurements are also affected much more by seasonal phenomena like El Nino which is not conducive to determining long term trends in global sea height. -10 mm/century. Not a large number. I would suspect even if the trend starts to trend the other way, the magnitude will probably be similar, not the meters that the IPCC predicted. Also, the first graph is rather astonishing, could it have been the sun the entire time? Can we figure out a way to scam people and make money off that? Dynamic Height is not the same as Sea Level! Please excuse the trigger pulling metaphor. Using all data might lead to wrong analysis due to the possibility that sensors malfunction, data gets corrupted during transmission etc. I would never propose that you look at the data first and then mess around with it until it fits your personal bias, which direction ever that would be. But AFAIK there are quality control bits in the Argo data? These three papers are a fine example of the peer review process because they disagree over a method of correction and come to different results. Oh, and I think the Leuliette Paper is better here because the other one is the AGU Member one. Very noticeable that you don't give any idea of the statistical significance of that trend. It is actually only about 0.005! In other words the data doesn't show any decrease at all. Obviously the time period and number of sites are insufficient to determine sea level changes. Ken: "the number of sites are insufficient": read the papers cited above. The current ARGO gridded network is considered to have statistically adequate coverage of 90% of the ocean's surface. Satellite altimetry also has 90% coverage. Papers have already been published on trends in ARGO data shorter than 6 years, but of course the more years the better! How many years data would you like to see before you realize how wildly divergent the IPCC projections are? The satellite altimetry data also confirms a leveling off of sea levels during the last decade. While it is nice that you acknowledge the input from the comments, there is still an issue here with the quality control. Well, since you are neither using realtime GTS data nor delayed data, which comes at least 1 year later, there might be data in there that is not quality checked. Of course that doesn't take into account that Satellite Altimetric Sea Surface Height (SSH) is not equal to Dynamic Height is not equal to Sea Level. Which leads to the conclusion that while your efforts are enthusiastic and your findings not necessarily wrong, the basic knowledge about Oceanography is insufficient, the terminology not completely taken in and the methodology sloppy. That should be "you are NOT working with the full dataset". Sry for that. This is wrong. The plot is dynamic height 0/100 dbar. The justification for using this as a sea surface height measurement is a plot of 0/1800. Essentially the 0/100 dbar plot measures only the top 100 metres of the ocean (1 dbar is about 1 metre depth). Erm. What I mean is that it is the height at 0 dbar *relative to* the height at 100 dbar. 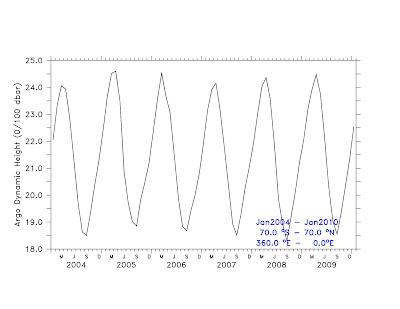 So the plot would not be inconsistent with the satellite record that shows a rise since 2004 of 10-12 mm if the rise is caused by the bit below 100 dbar in depth (about 100 metres). Steve Milesworthy: Thanks for your suggestion. Argo doesn't provide data in the Pacific Marine Atlas at 1800dbar, but do at 1900dbar, so I assume you would be fine with that. Just took a look at the graph of 0/1900 dbar and it looks by eyeball to also show a similar downtrend as 0/100dbar, but will have to digitize it and plot the trendline & will post here. Speaking of trendlines, does anyone want to volunteer to offer more sophisticated statistical analysis of the plotted data? e.g. removing the seasonal component by fitting a least squares sinewave, removing that component, and then a linear fit? (similar to some of the papers above)or other suggestions please? Science Shmience: thanks for the comments, but 1) the Pacific Marine Atlas doesn't even allow one to set any quality control flags (I assume because they have already done the RT checks they speak of)I believe they are talking to people using the raw realtime data with respect to the QC flags. 3) when you download the Pacific Marine Atlas you do receive the delayed quality checked data from 2004 up until the near present. They recommend reloading the entire database on an annual basis for purposes of comparing mean anomalies only. Mate, my I ask how you produced that trend line? Is it a least-squares regression, or did you just plop it in? Ken said: [snip-ad hominem comment] "My analysis indicates that the trend slope will be in the range -0.20 to +0.12 at the 95% confidence level." Thank you for suggesting I add confidence limits & I agree & will be adding to the updated graph I'm working on which is using the dynamic height 0-1750 dbar instead of 0-100 dbar as suggested by a prior comment and in the SSH v. DH graph above. What we are looking for here is a small presumably linear trend in data that has a relatively large semi-sinusoidal component relative to the tiny long term trend, and by what means the confidence limits can be tightened. I've been studying the papers linked above as to the appropriate statistical analysis and it appears to me that removing the seasonal component by fitting a least squares sine wave to the data, removing that component, and then a linear fit may allow tighter confidence limits. Shouldn't alter the linear trend though. Do you agree? Sea level rises are due to both steric (thermal expansion) and land ice melt. The steric rise in the Argo era is low, but combined with the estimates of land ice loss, is consistent with the satellite altimetry showing a rise of 2.4mm per year over the same period according to the Cazenave paper you cited. This arguably validates the longer term altimetry from the satellites showing a 3mm per year rise. Steve Milesworthy: Duly noted, I have removed the misstatement. What is one of the most important aspects about West Antarctica with respect to global sea level? Are they any tables or charts that show the relative affect of gravity vs distance from sea level?